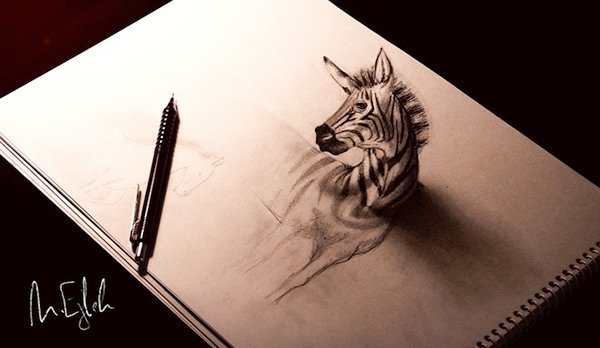 3D pencil art can be both simple and impressive at the same time. They force the viewer to see beyond the usual perspective and some 3D realistic pencil drawings can even stun them at first glance. 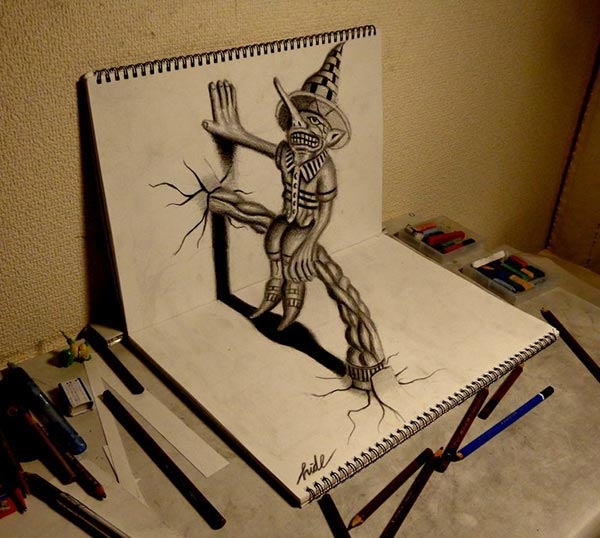 Most 3D pencil drawing illusions are meant to convey a hidden message in the background and can easily be incorporated into any context. Amazing 3D Pencil Art depicts is a sketch of high-resolution 3D Elephant drawn by using pencil on a blank white paper by Sandor Vamos. 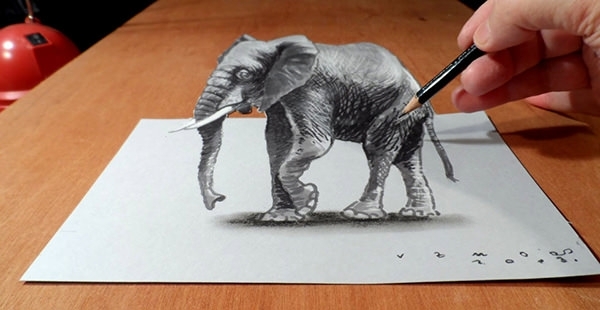 The 3D effect makes it look like a long tusk elephant is walking on the white paper. 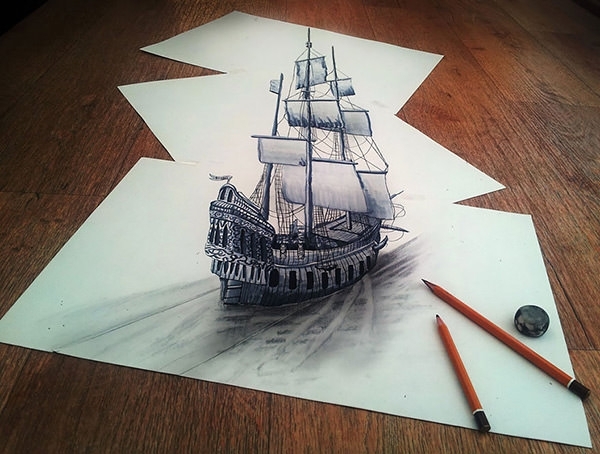 Best 3D Pencil Drawing shows While Sailing through the Thoughts of My Imagination by artist Ramon Bruin. It shows a sketch of a medieval ship sailing on the surface of white papers. It has in details all the minute parts drawn in such way that they actually looks like a real ship. 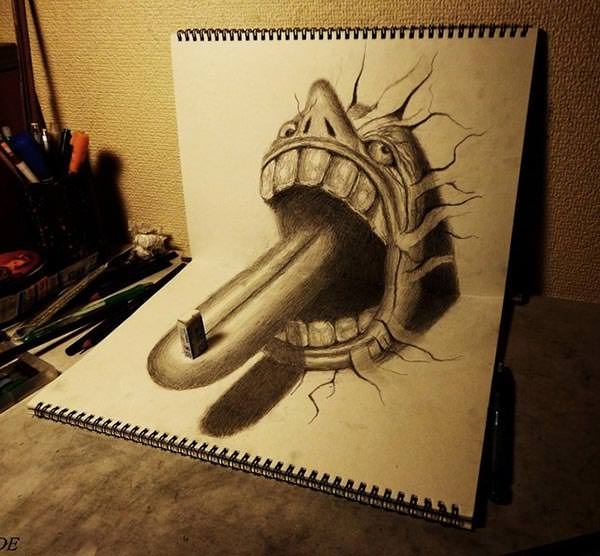 Realistic 3D Pencil Drawing shows a big sketch of a gun coming out of a hole in the wall. 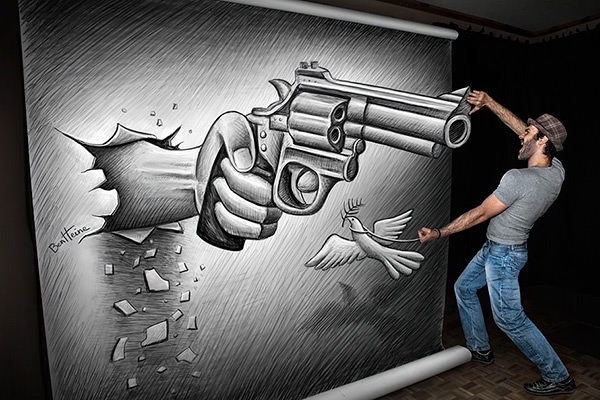 Here, the artist Ben Heine is trying to stop the gun with his hands and the dove seems like it is tied to his left hand. 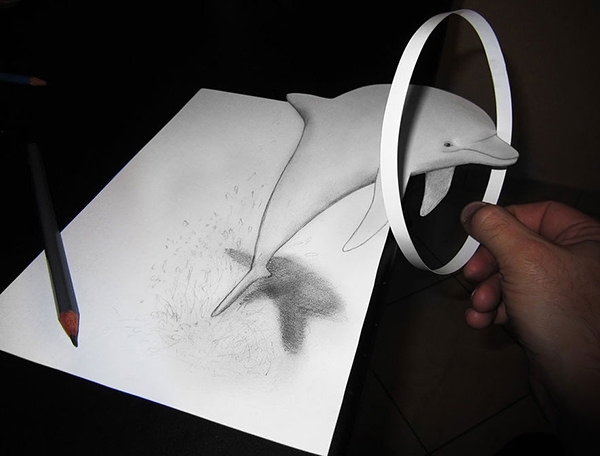 Dolphin 3D pencil art drawing by artist Alessandro Diddi depicts the real hand of a person holding a cut out paper ring and giving the sketched dolphin, training to jump through that ring. It looks like a real dolphin getting ready to jump through the ring. Pencil Sketch Gallery shows the 3D pencil drawing of an anamorphic photographer versus a real illustrator on a large paper spread out on the floor. 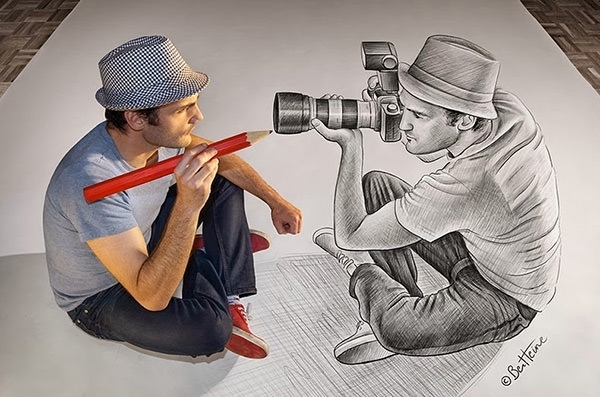 It has 3D effect where the real artist is sitting in front of the illustrated photographer. This is the work of artist Ben Heine. 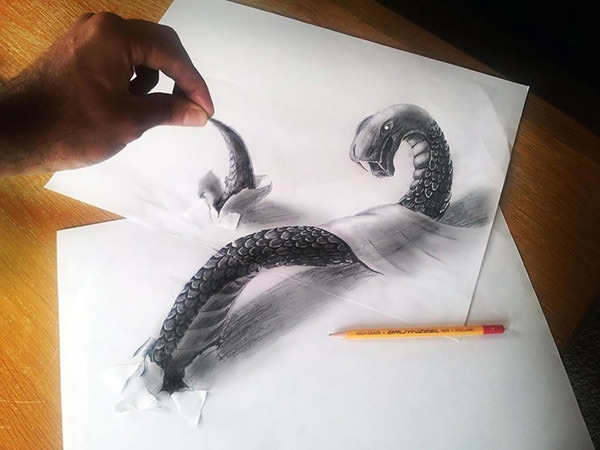 3D Drawing Pencil Illustration shows the artwork of artist Martin F. Galery. 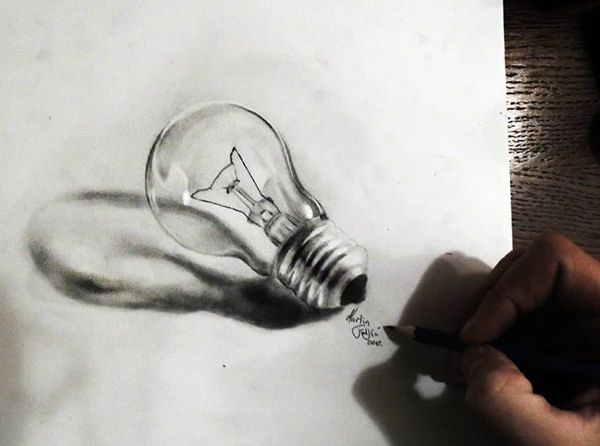 It has high-resolution 3D sketch of a lightbulb lying on top of a paper. It looks as if you can be able to light the bulb realistic feel. Amazing 3D Dragon Art image is a high-resolution sketch of a 3D T-Rex by Sandor Vamos. 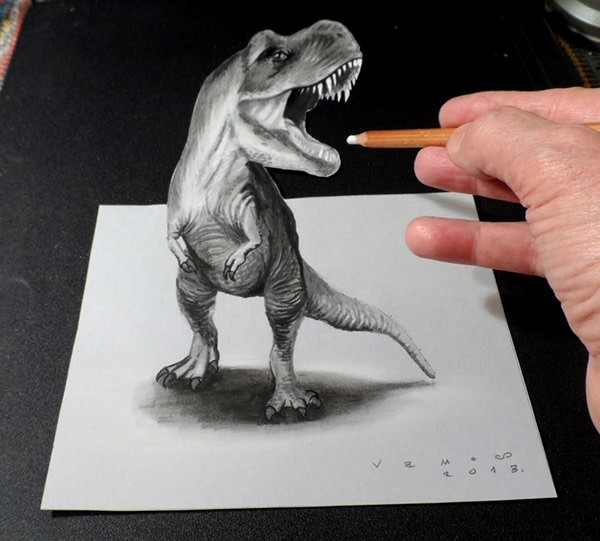 It looks so real that it seems like the T-Rex is going to bite off the artist’s fingers while drawing it. The head part is cutout to give more realistic feel. 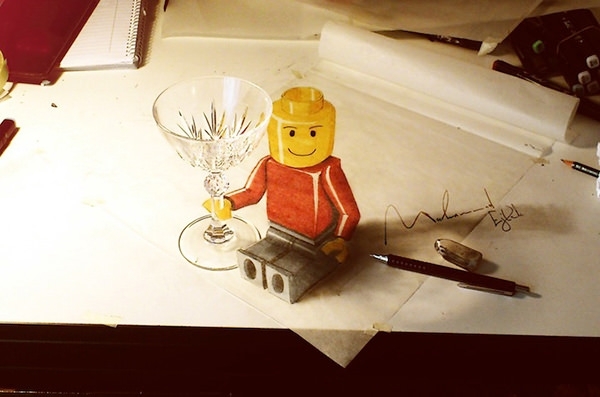 Best 3D Pencil Art has the Lego man 3D pencil sketch by artist Muhammad-Ejleh. Here, the sketch shows a colourful red, yellow and gray smiling Lego man sitting up and hanging on to a wine glass with his right hand. 3D Pencil Sketches comes with the sketch of Chapter Z by Ramon Bruin. It is of 70 x 50cm size. 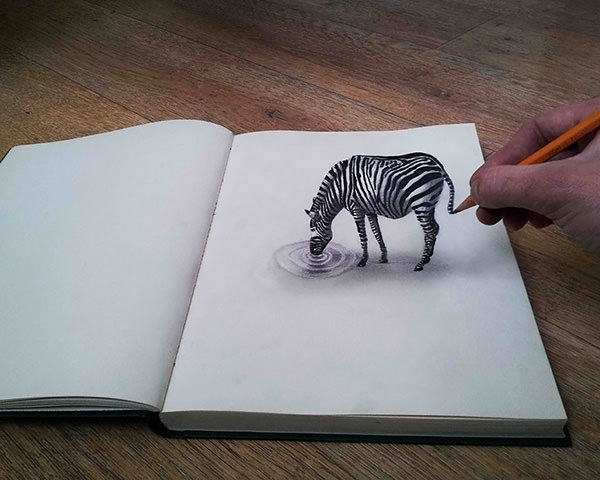 Here, u can see that a zebra seems to be drinking water in the middle of the white blank paper. 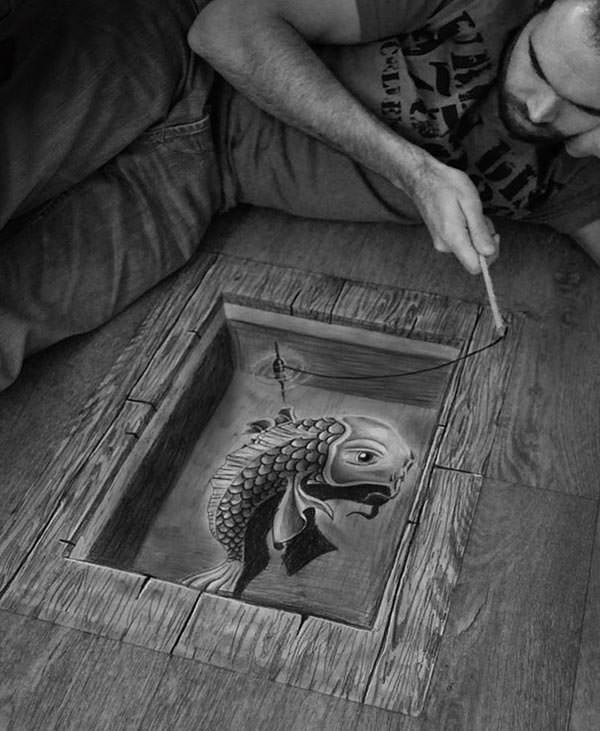 Inspiring Best 3D Pencil Art has the 3D pencil artwork of Alessandro Diddi. 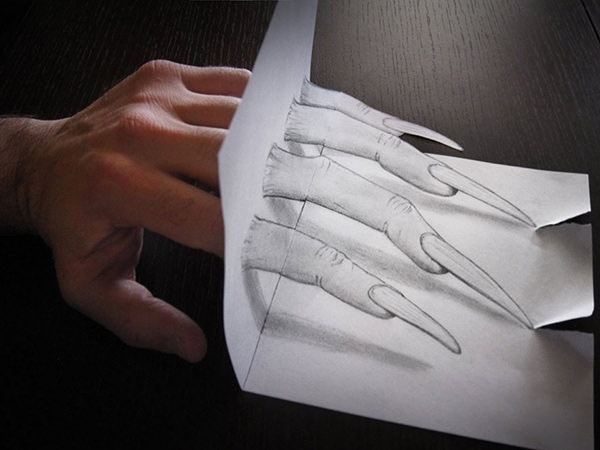 His sketch of four fingers with long claws or nails coming out on the other side of the paper looks real. Moreover, the sketch of his little finger is cutout to give more realistic 3D look. 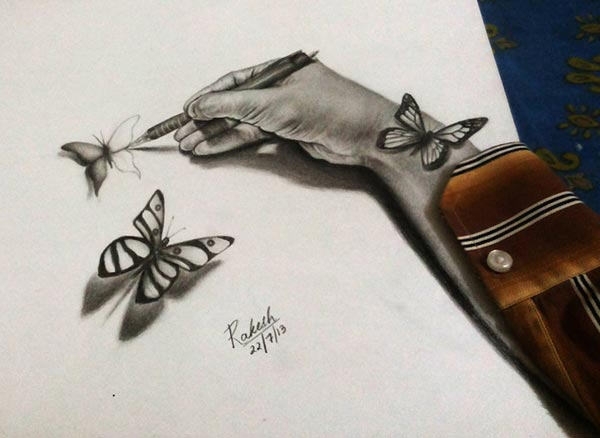 Butterflies Pencil Art as the name suggests has high-resolution 3D sketches of three varieties of butterflies. It also shows a sketch of the artist drawing a butterfly. It gives a realistic look as the artist has added a real shirtsleeve on top of the sketch. 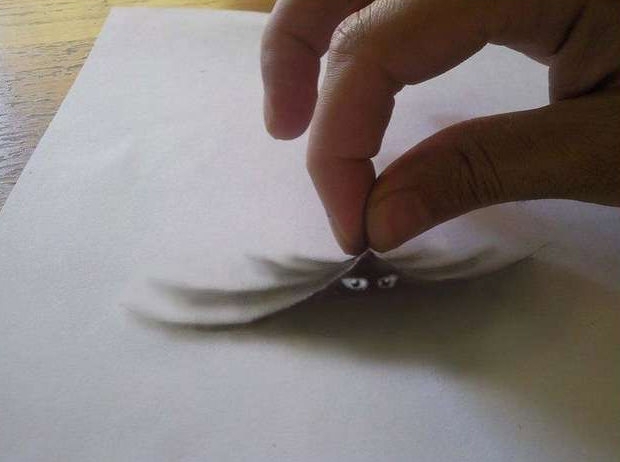 Created through careful airbrushing and shading techniques the 3D pencil drawings on paper can seem to be quite inconceivable. But with practice and learning the techniques from other free creative 3D drawing and images any one can master the art. 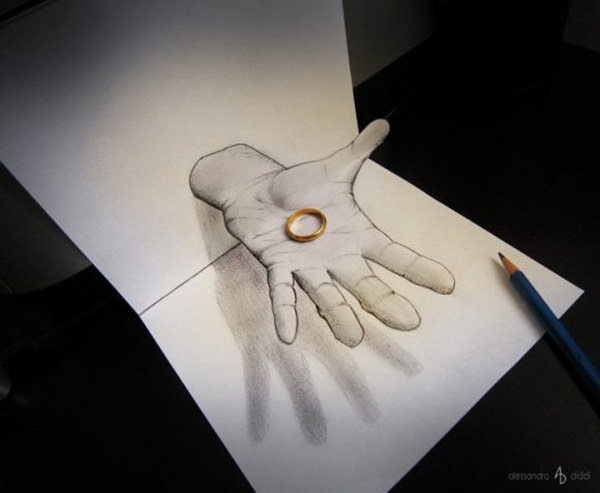 Find photos and pictures of top 3D pencil art drawings here. 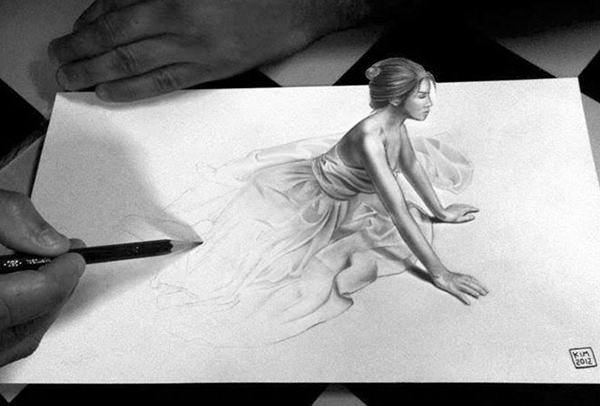 3D Pencil Sketch shows a high-resolution 3D sketch of a sitting girl in a beautiful white dress slowly emerging out from the white blank paper. This is the work of artist Kim and the sketch and titled as Sitting Girl. 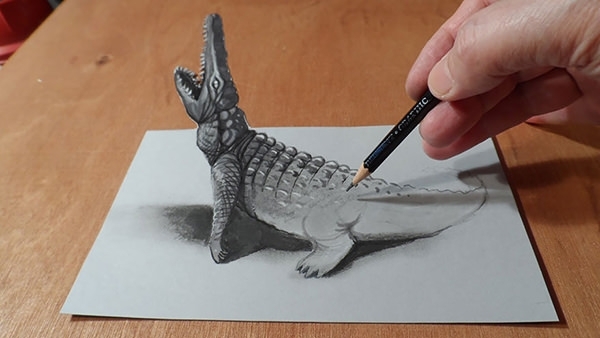 Unique 3D Pencil Drawing shows high-resolution 3D drawing by the name of Residents on the sketchbook by artist Nagaihideyuki. It is showing the sketch of a person or the resident of the book trying to stop or hold back the book from closing. 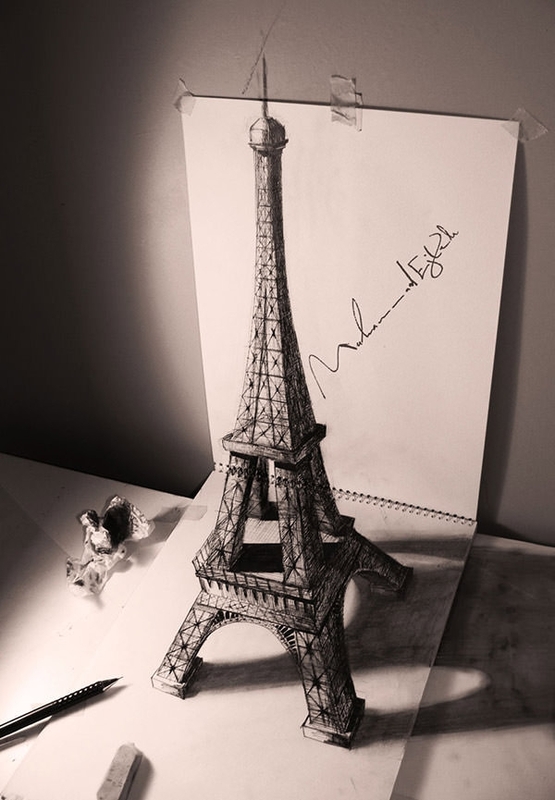 Amazing 3D Pencil Drawing of Eiffel tower 3D artwork is the amazing work of artist Muhammad-Ejleh. It does not look like a sketch of the Eiffel tower but a replica of the tower standing tall on top of a plain paper. Here, the artist has drawn the tip of the tower on the wall to make it look more realistic. 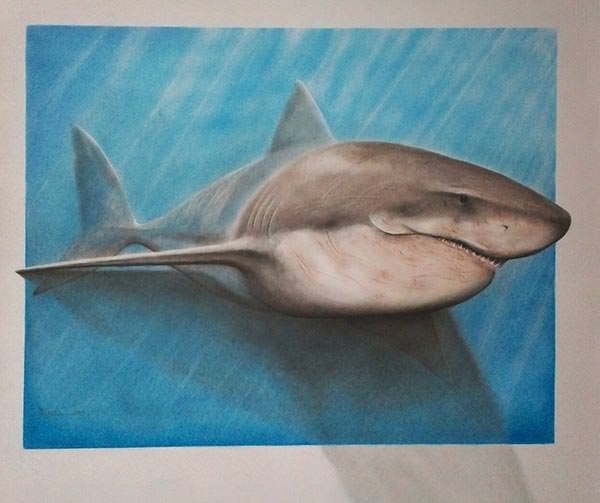 Shark 3D Pencil Drawing has a high-resolution 3D sketch of a great white shark making its way out of the page of blue water. This is the creation of artist Anthony Rojas. The artist had mixed charcoal and pastel on this pencil sketch.